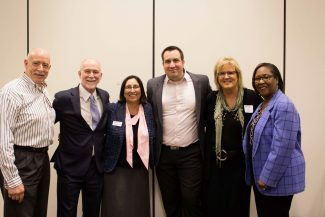 The Newman University School of Business launched its Distinguished Speaker Series on Tuesday, March 28 with a keynote presented by David Burkus. 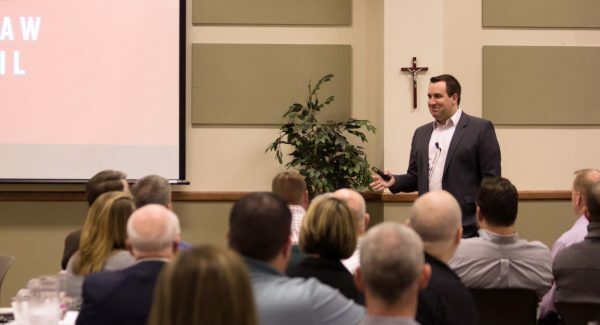 Burkus is a best-selling author, podcaster and associate professor at Oral Roberts University whose most recent book, Under New Management, was the focus of his presentation to the audience at Newman. More than 100 individuals gathered in the Dugan-Gorges Conference Center on campus to listen to what Burkus had to offer. Burkus talked to the audience about innovation within businesses and how businesses today are changing the game when it comes to hiring and managing. “My goal today is to talk about the things that I’ve found over the past years studying a variety of different companies that are doing things differently and attracting talent,” Burkus said. Andrews said this event was the first of many to come, adding that the Business Speaker Series will continue as an annual event at Newman. For more information on the series, contact Andrews at 316-942-4291, ext. 2111 or by e-mail at andrewsb@newmanu.edu.